When I was in Nicaragua, I was wrecked. I already told you that, but I’m still not over it. And it wasn’t the different food or the economy or any of those things that wrecked me. It was the faces. Faces, precious faces. Faces of beautiful sons and daughters–with real pain, real need, and real sickness. Faces that belonged to precious sons and daughters who needed to hear the beautiful words: You have a Father God–Abba Papi–who loves you. Their faces are with me still, and I don’t believe I will ever forget. As I am writing this, I am in an airplane somewhere between St. Louis, Missouri and Denver, Colorado. It’s dark outside and we must be flying over an area that is sparsely populated because looking out my window I can’t see much but darkness. However, in the distance I see a little cluster of lights. There don’t seem to be many. It’s obvious that there isn’t a large population of people. Maybe it is a tiny community of people living there, clustered close together in the darkness. I can tell you one thing though: even though I can just see a few lights, they sure seem to shine bright in all that inky blackness. As I sit and look at that tiny cluster of bright lights, I can’t help but think about an idea that has been ping-ponging around in my head for quite a while. God actually laid in on my heart on another night time flight very similar to this one about eight months ago. I was making this same trek to Los Angeles, or maybe even via Denver, Colorado; I don’t specifically remember. What I do remember is that I had just finished up an amazing book and had laid my head against the window to pray. I was asking God to open my eyes to not only His calling on my life, but also to the people he was calling me to. My hear felt raw and ready after my reading and I knew that God had been calling me out of my comfort zone and into ministry, but I didn’t see the specifics of His plan yet. When I opened my eyes, it was like my sweet Heavenly Father had painted a beautiful picture of what He wanted from me. We were flying over some large city and the earth below me looked like it was decorated with twinkling Christmas lights. It was overwhelmingly beautiful and even just recalling this memory makes my eyes fill with tears. The longer that I looked, my perspective began to change ever so slightly. Instead of just a blanket of sparkling light, I began to see each individual light. Each little light was a home or a business or a street light in a neighborhood. The river of lights flowing beneath me wasn’t uniform anymore. It was composed of many individual lights. These lights were the headlights of cars filled with families, friends, or maybe even a husband and wife returning home from a much needed date night. Each light represented a group or an individual, and each one of those individuals was important to God. He knows them by name. He’s numbered the hairs on their head and has seen every tear they have cried. He loved them enough to go to the cross for them. Jesus didn’t go to the cross for the sea of shimmering lights collectively, but for each individual one. Just like I was able to see past the blanket of twinkling lights to really see each individual light, God was calling me to stop looking at people as a whole and to really see each individual one. I felt like He was telling me that each person has an immense value to him. Each and every one was unique and each and every one mattered. They all needed to know of God’s love because every person had the opportunity to shine as a light for Him. Looking out the window on this flight, as I am writing, He’s reminding me of that again. Instead of seeing the vast glow of light spread out beneath me, I see a small cluster sitting in the darkness shining brightly. I can hear God speaking another message this time. It is similar to the first, but different as well. My mind flips through the image I see now and the image I saw on that other flight months ago, while my heart studies the message they both convey. You see, they almost seem to conflict. Months before I felt like God was calling me to see the importance of each unique person and the value of each person shining as a light. Right now it seems as if God is saying that a little group can illuminate even the darkest night. And although the two messages seem to conflict, they actually go hand in hand. Every. single. person. matters to God. Each one is near and dear to Him. Our Father wants us to look at the people that we meet in that same context. He wants us to truly see them as the unique treasure that they are to Him. He wants us to get to know them and to discover what it is that makes them so loved by Him. Instead of making assumptions about people based on how we categorize them, God calls us to really see them, to value them, to love them as He does, and to try to reach them as individuals. Not only that, God has called us to be light. Light doesn’t hide. It shines brightly to illuminate the dark around it. As God’s light, we are called to do that same thing. We are to glow with God’s love. That light should be visible to those that look at us. Like a moth to a flame, people should be drawn to it and thus drawn to Him. This is the idea that has been rattling around in my mind. It is the one that is really pressing on my heart. It was born from that little cluster of light shining so brightly in the night. When we stand together, our light is multiplied, compounded, and magnified. I’m drawn to this little cluster of lights in a tight little ring. I can still pick out each individual light, but they seem to form a collective. It wasn’t a vast sea, like the one before, but a little point of brightness that stood out as such a sharp contrast to its surrounding. Because these lights are nestled closely together creating a little group, I picture them as a community … and we need community. We can be a light on our own, but it is when we join together in community that we really shine the brightest. Community make us stronger. It builds us up and encourages us. A good community provides a sharp contrast to the darkness that can sometimes surround us. So what’s the takeaway for you and me? Let your own individual light shine. Look at the individuals around you and see the unique way God has called them to be a light for Him. Then join together with a community and shine even brighter. Light up the dark. Illuminate the world. 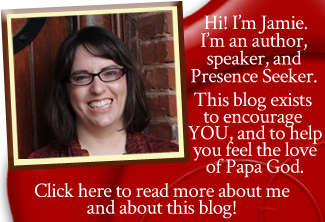 Note from Jamie: Does this post speak to your heart the way it does mine? If so, please leave a comment below, and bless Bobbie–and go follow her on Facebook! 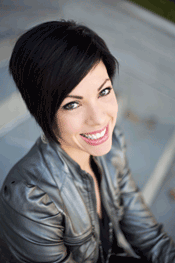 Bobbie Schaeperkoetter is married to her high school sweet heart and is a homeschooling mama of two wild boys. She adores community and encouraging women. She’s a little bit of a hot mess, but is just doing her best to honor him in the craziness of life. Bobbie is also a writer and blogger at www.bobbieschae.com and www.facebook.com/bobbieschae. She would love for you to stop by and say hello. Go for it, sister. “Who are you” is that you are a daughter of the Most High King; a queen and a priest unto our Father. There’s no greater ministry than ministering directly unto the Lord in prayer. Prayer is a ministry to His heart personally. I pray He would fill you with His Spirit of grace and supplication and that the Holy Spirit would pray through you, for you, and in you with moanings and groanings which cannot be uttered; that He would give you a heart for fervent, unceasing prayer and use you powerfully as an intercessor to shake this generation. In Jesus’ name. Oh my this message so touched my heart. It was as if I was watching it along side of you. Thank you for the reminder we need of the commitment to Jesus to not hide our light but to allow our light to illuminate the darkness wherever we might be, and to have eyes of our Father to see into their hearts and touch them with the love of the Father. My husband and I are preparing to have a hospital visitation ministry and your encouraging word just brought that to light. Thank you for sharing your gem of love from the Lord. Amen. I pray your visitation ministry would be blessed and that you would see many healings, Gwynne. I have been praying for your healing as well. Love and hugs to you, sister! Yes! God has putted a greater light in each individual. That light in us cannot be hidden because each one of us is set on a hill by our Papa God to shine forth before men to see our good deeds and give glory to God. The light in Christ Jesus is a light to the whole world, through him I posses that light also in me. As I draw many to him, we shine to overcome every darkness. Oh Lord help me to see individual person as the way you see them. God bless you Sister Jamie for this powerful and an inspired message shared. Amen, brother Clement. Thank you for reading today! May we all shine more brightly as we are filled with the glory of our Lord, in Jesus’ name. priase the lord halleluyah.thank you lord. thanks jesus and holy spirt. thanks jamie mother. i m rekha sharma from india. t read daily email. from his presence. i reuested to u plz prayer for my life settlement. i am divorcee . alone. i hav daughter 15 yrs. i m in private job. my life is too hard and busy schedule. i have no home. plz pray for me to father jesus. for my life. I will pray for you, Rashmi. Thank you for reading!